← “A Living, Emerging Vision” – The Land Of Org. Change is normal and natural to people when we have some understanding, influence, desire and choice in that ‘change’ – we change our fashions, what we eat every day or the type of cars we drive. Just look how the rapid change in technology has had a dramatic change in our culture and our lives in general … from computers to notebooks to high tech watches that do not even have a name yet. No one has a phone anymore, we carry around a library of world information in our pockets that we just happen to be able to make a phone call with – yep, change is all around us and at the speed of light… nothing and no one stands still. The real issue with organizations is that the ‘change’ may be in a direction that is not desired – such as when people and organizations become even more ‘siloed’, more territorial, where conflict and stress increases, morale lowers, people feel increasingly disengaged and learn greater skills just to survive in their work world. The point is that this is still ‘change’ – as some organizational cultures, processes and systems do facilitate such ‘undesired change’, as we know. There is an old OD saying: “Organizations perform exactly as they are designed to perform.” Again, such ‘performance’ may not be the kind or level of performance that is desired. Another significant issue is that when a ‘change initiative’ starts, it is not dealing with a totally stagnant organization – such an initiative is ‘coming into’ a very fluid organization. Sometimes it can be like getting a footing on a conveyor belt that just seems to want to go it’s own direction – and not the one desired. This is a very dynamic question and challenge. 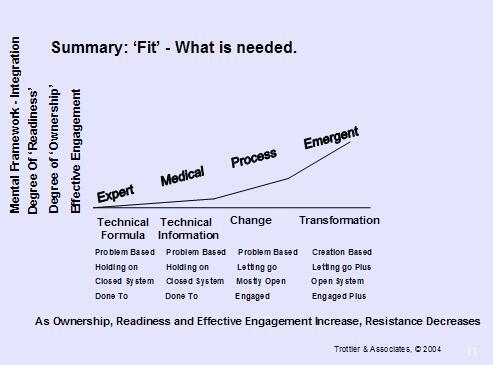 “Readiness’ does not stand alone in creating the ‘desired change’ – individual, group and organizational dynamics of ‘ownership’ and ‘effective engagement’ are also needed to be embedded into the methodology and approach to be effective toward creating the ‘desired change’. They need to work together is a synergistic manner for ‘desired change and development’ to take effect. “Readiness” simply is an ‘internal drive and a desired choice’ that creates a willingness to do something about something. Having “ownership” means that people have participated in something to a degree that they have invested a part of themselves both cognitively and emotionally so that they now ’own it’. This means they have assimilated, internalized and integrated the ’thing’ freely and their thoughts, beliefs, emotions, actions are now a part of it. Having ‘ownership’ enhances the probability that they will improve it, evolve it, invest more of their time and themselves in it, and act on it. “Effective Engagement” means that people are engaged in their work world in a way that has meaningfulness to them and each person as an individual, and as part of a team, ‘experiences’ accomplishment aligned to desired results . 1. Engagement through ‘workshops’, surveys, general assessments, events, etc. 2. Engagement through people’s day-to-day work functions. Some examples may include continuous involvement through strategic alignment / business/ operational planning and implementation, ‘open meetings’, cross-functional project teams, group problem-solving, the use of continuous performance feedback systems for performance tracking and improvement, involvement in re-designing business processes to facilitate increased effectiveness, the ease of availability and use of business information systems, continuous improvement approaches, effective coaching / mentoring… all are some examples that support effective engagement through people’s day-to-day work functions. 3. “Engagement” through ‘job design’ and the degree of ‘control on the job’. Examples may include such things as degree of control of resouce generation and allocation, decision-making autonomy, the degree of self-management and self-development, control of performance information systems, continuous improvement processes built into work processes, etc. may be appropriate to create ‘effective engagement’. The above may and probably will involve changes to the structure, role, norms, functions, tools, technologies, relationships, business processes, information systems, etc., to the job function / design and relevant competencies. People doing the job certainly need to be effectively engaged in ‘re-designing’ the job. 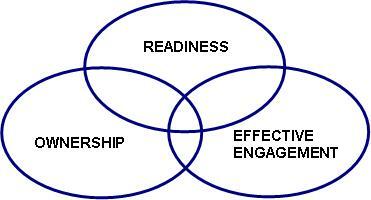 Real ‘effective engagement’ that makes a real difference is not a simple thing that happens ‘over-night’. The up-side, at least in my experience, is that people want to be engaged both in ‘the business of the business’, as well as the things that impact their performance, and their desire and ability to experience achievement. Why are all four of these dynamics of change needed to some appropriate degree? Let me share an example of an organization that did have a high degree of ‘readiness’ for change. At an international energy organization, everyone there was really, really ‘ready’ for positive transformational change. (They did a ‘readiness’ survey’) Everyone had been working in an environment of ‘command and control’, lack of direction, stressful workplaces, poor management / employee relations, silos, etc., etc. – basically a work environment of survival, mistrust and getting enough done so as not to get fired. Yes, they were very much ready for ‘change’ – and the best people sought ‘change’ by leaving and joining other organizations. So management decided to lead change in the same-old-same-old manner of ‘telling-and-selling – getting buy-in’, directing the change with the traditional manner of hierarchical authority. They did not communicate why the change was needed in business terms that people could relate to in their jobs, they did not support their words with an effective budget, resources and support although they did have all the ‘formal presentations’ – but did not listen to people. The organization also peformed a very large ’employee engagement survey’ without engaging their employees in the process, and the survey results took over a month for ‘feedback’ (by that time the survey was mostly forgotten), no open dialogue, no change in perspectives on either side, no opportunity to influence, no real connection as people – only traditional roles and figures of status, etc., etc. What do you think happened? You are correct – people went back to the same day-to-day functioning and even drew deeper into their silos and protective behaviors. Why? Because the necessary degree of ‘ownership’ and ‘effective engagement’ were missing in the process of change.